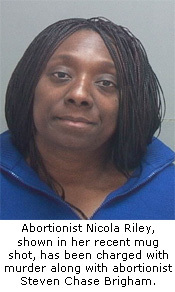 Elkton, MD – Operation Rescue has learned that abortionists Steven Chase Brigham and Nicola Irene Riley have been charged with murder related to the deaths of viable babies at an illegal secret abortion clinic that the pair operated in Elkton, Maryland. Brigham is currently in the custody at the Camden County Jail in New Jersey and Riley was arrested and Riley is currently in the custody of the Salt Lake County Jail in Utah. Both are awaiting extradition to Maryland. Brigham was charged with five counts of first-degree murder and five counts of second-degree murder. Riley was charged with one count of first-degree murder and one count of second-degree murder. The charges are the result of a Grand Jury investigation. UPDATE: in addition, Brigham and Riley were each charged with one count of conspiracy to commit murder. Please watch for developments on this is a breaking news story.